Yesterday was the day when the thesis component of the OII MSc properly kicked off – so I hope I’ll be updating this blog more regularly for the next three months whilst I’m dedicating most of my time to this research. 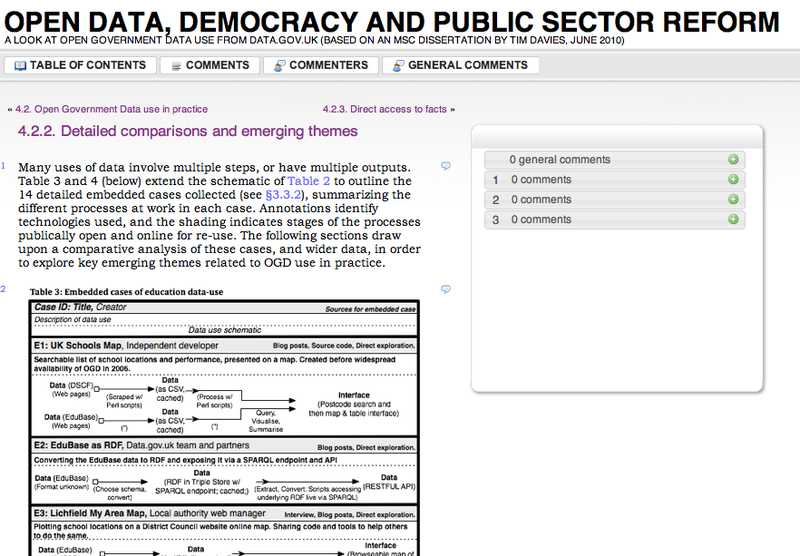 Over the last couple of months I’ve been collecting a wide range of links, tweets and other written sources to help make sure I capture a wide-ranging overview of the government open data world, before narrowing down to focus in particular on how certain uses of data come about. 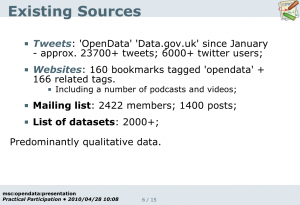 As I head now to also collecting a range of interview transcripts, and trying to build a small list of selected uses of open data, I need a way of managing all the information I’ve gathered. Conventional Computer Assisted Qualitative Data Analysis Software (CAQDAS) such as NVivo tends to be on the expensive side, and the resulting files of data are hard to make openly accessible after use – so I’ve turned to my favorite CMS to see if I can construct a basic set of tools for modeling the qualitative data I have. I’m building the system as I go along – so I’m sure the plan will change along the way. In theory this approach should allow me to share a significant amount of the data later in the process as RDF, though I’ve still got to look into and resolve ethical issues around privacy – as whilst the interview transcripts will remain confidential, I need to ensure that any triples articulating relationships that result from marking up those transcripts are carefully reviewed for whether they constitute public knowledge or should be kept private.